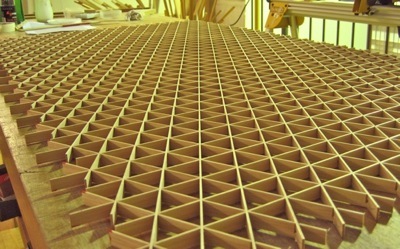 In the hexagonal (kikkō — tortoiseshell) patterns, the hexagon jigumi is made up of a series of equilateral triangles formed with the three-way joint (mitsu-kude). These are the patterns that highlight the kumiko shokunin's skill. The accuracy of the cuts in the mitsu-kude is absolutely critical, and a good indication of the accuracy is how straight the long diagonals are. 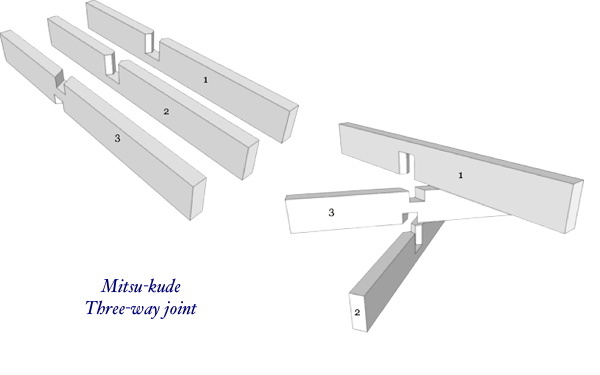 I briefly describe how I cut the mitsu-kude joints in my blog entry here.